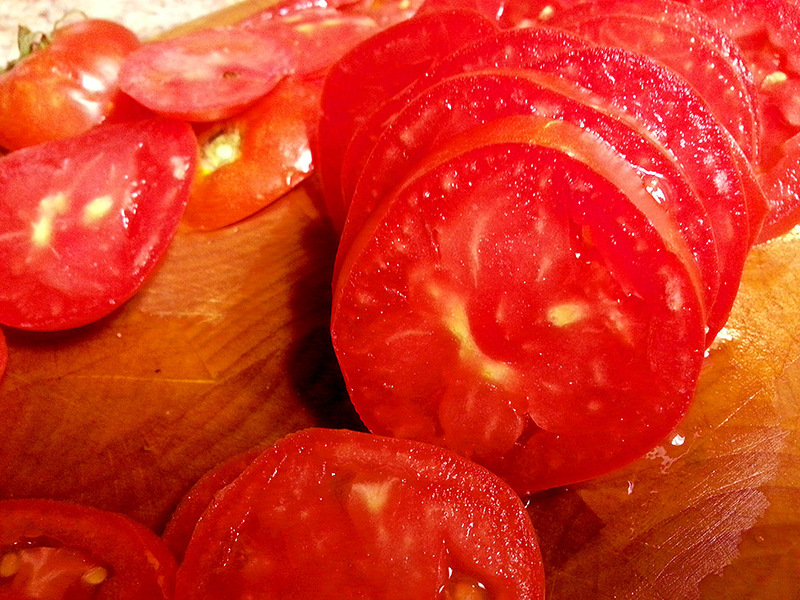 One thing I’ve always wanted is to have home-grown tomatoes in the summertime. 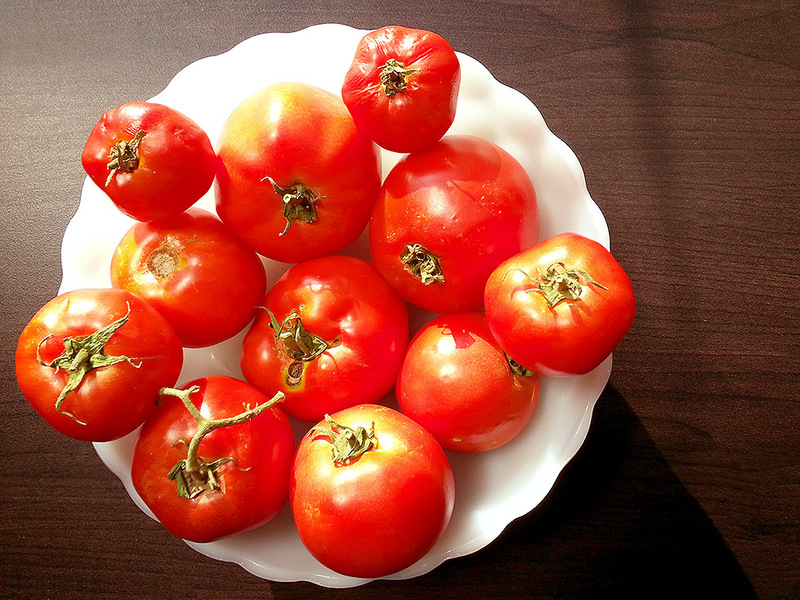 I can think of few things better than picking some fresh tomatoes off the vine from my own sunny back yard and turning them into some lovely dish in my kitchen. With my lack of a green thumb, I think this scenario has flown right out the window. Nevertheless, I was fortunate enough last weekend to pick some fresh tomatoes myself, even if they weren’t from my own plants! Apple Annie’s Orchard in Willcox is just about a half an hour from my mom’s house in southern AZ, so we had sort of a family day there with me, my mom, sister and our stepdad. Our main goal was to pick fresh peaches, but I knew I couldn’t pass up their you-pick tomatoes. 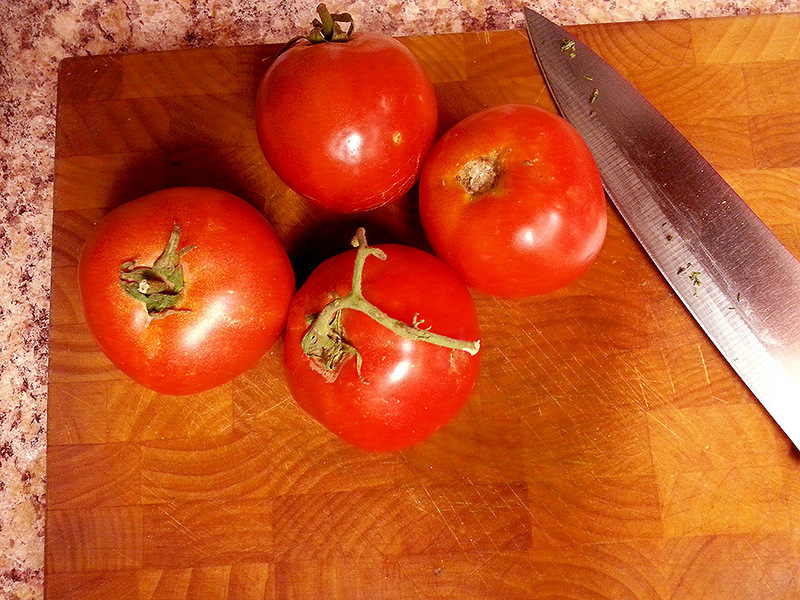 It’s sort of sad just how anemic grocery store tomatoes can be. The difference in color and ripeness is staggeringly different when you compare them to deep red ripe tomatoes just picked off the vine. And the juice! My God, the juice. Storebought tomatoes are downright dry compared to these babies. I wish I had access to these tomatoes all year round cause they’re truly incomparable. 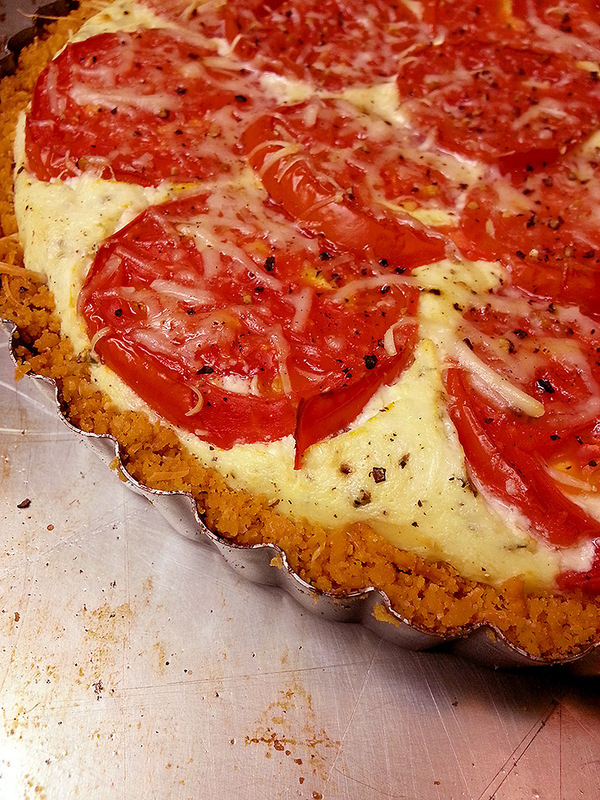 I wanted a dish that was simple and contained flavors that wouldn’t outshine the taste of these awesome tomatoes, so I settled on a savory tart. 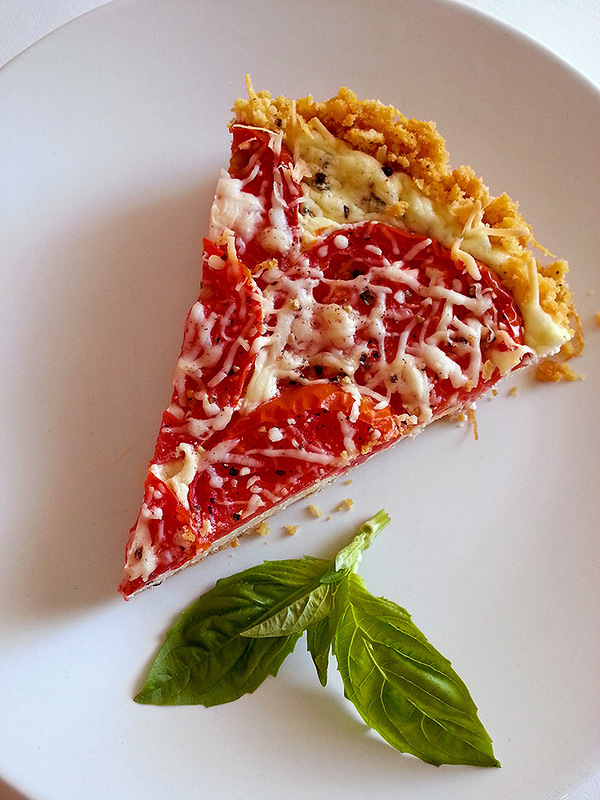 Creamy ricotta spiked with a little fresh basil, parmesan cheese and black pepper, topped with slices of these gorgeous tomatoes and held together by a crumbly, buttery cracker crust! Perfection. It’s summertime to the tenth power. Start out by preheating the oven to 375. Grab a standard 9″ fluted tart pan with a removable bottom, and spray the bottom with cooking spray. 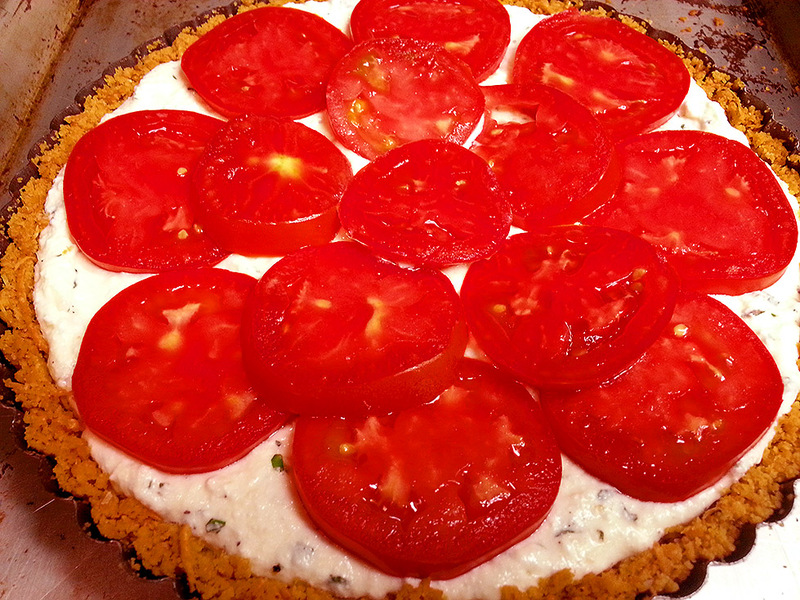 Line the bottom with a round of parchment paper and set the pan aside on a sheet pan. Next, git yer crust goin’! 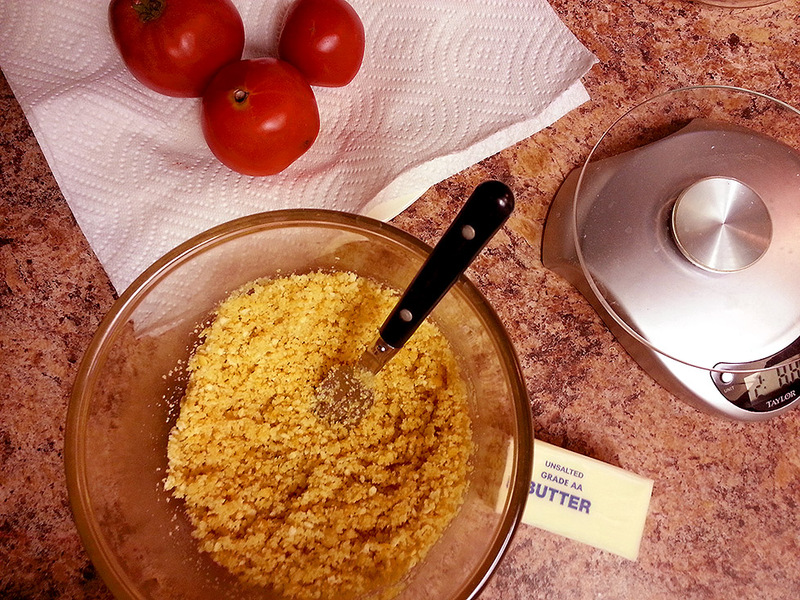 In a food processor, pulse the crackers until they’re very finely ground. Dump the cracker crumbs into a medium sized bowl and microwave the butter in a separate small bowl until it’s fully melted, about 30-40 seconds. 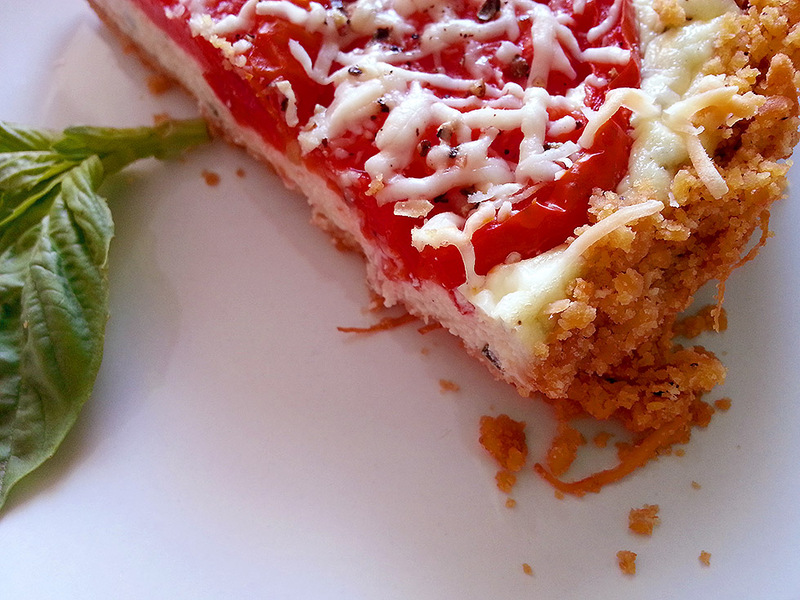 Stir the melted butter into the crumbs with a fork, and stir in the salt, pepper and cheese as well. 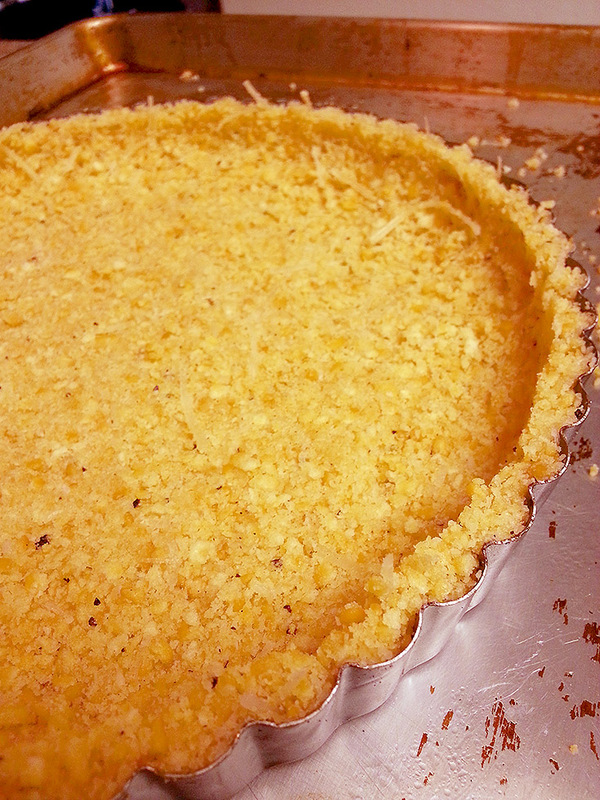 Pour the crumb mixture into the lined tart pan and carefully press it into the bottom and sides of the pan. 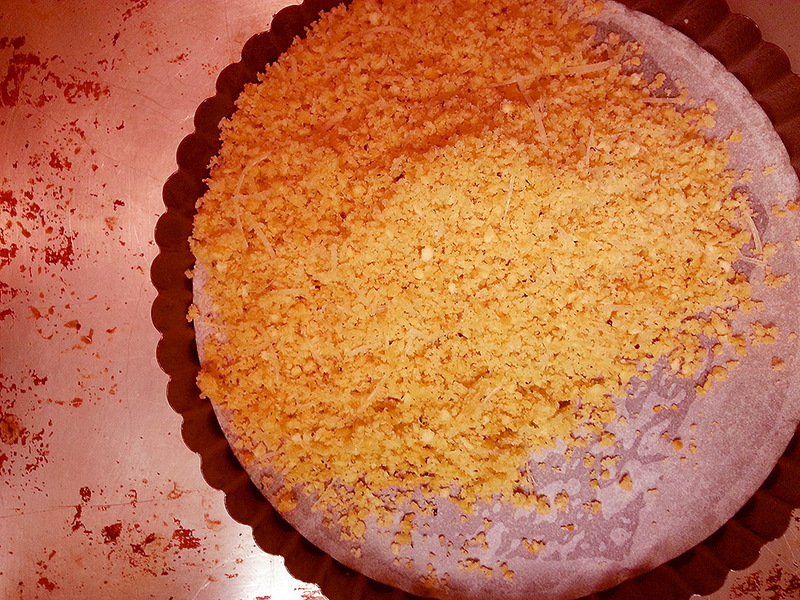 To get a nice edge on the sides, push some of the crumbs toward the outside edge so you have a little mound going all the way around the outside of the pan. Press these crumbs firmly toward the edges of the pan with your hand flat on the bottom of the crust, and pressing toward the edge of the pan with the outside of your index finger. Using the thumb on your opposite hand, simultaneously press down on the top edge to meet the crumbs as they come up the side while they’re being pressed outward with your index finger. Hopefully you’ll end up with a nice, even and straight-sided crust. When your crust is formed, pop it into the oven on the sheet pan and bake at 375 for 20 minutes. It should be golden brown when it’s done. 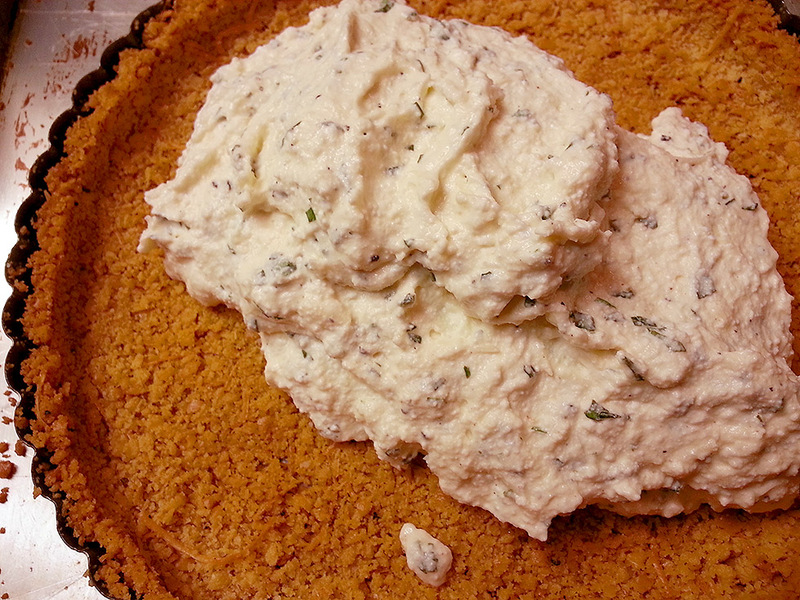 While the crust bakes, scoop the ricotta into a medium sized bowl and add the chopped basil, egg, parmesan, salt, and pepper. Stir all of this until it’s well combined and set it aside. 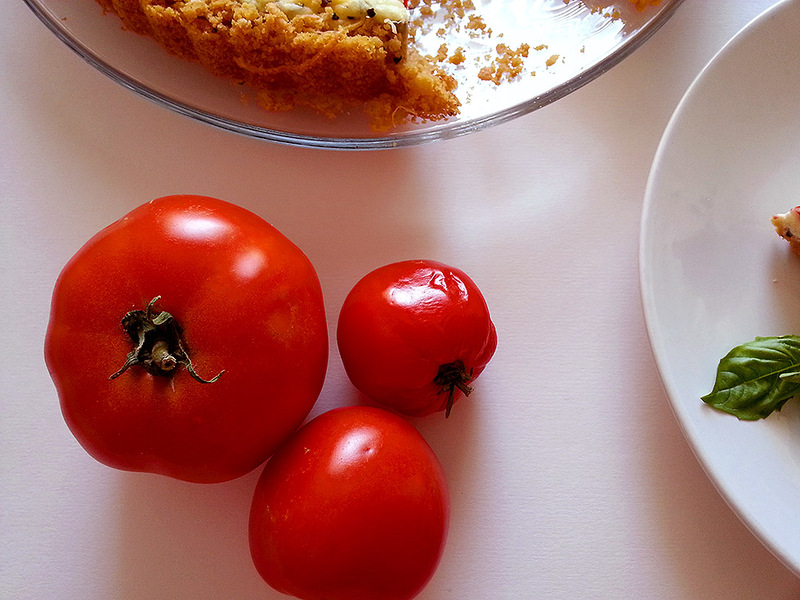 Slice your (washed and squeaky clean) tomatoes into 1/4 inch thick slices. 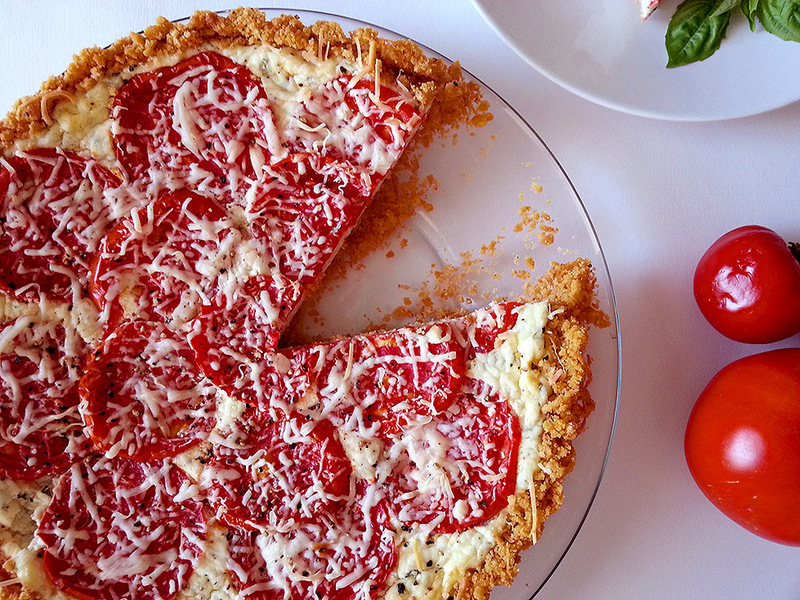 If you want to eat a few slices as you go, I understand. 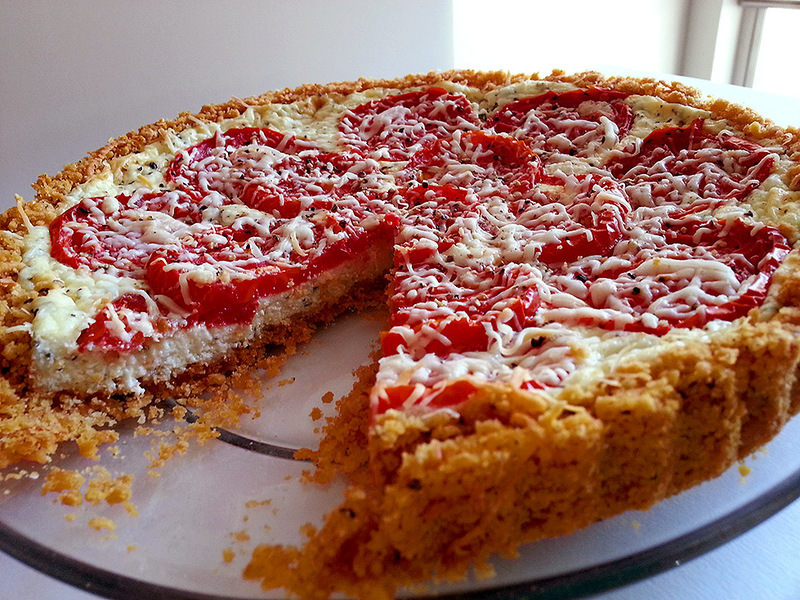 Once the crust is out of the oven, carefully spread the ricotta filling evenly into the tart crust, being careful not to lift any of the crumbs off the surface of the pan. 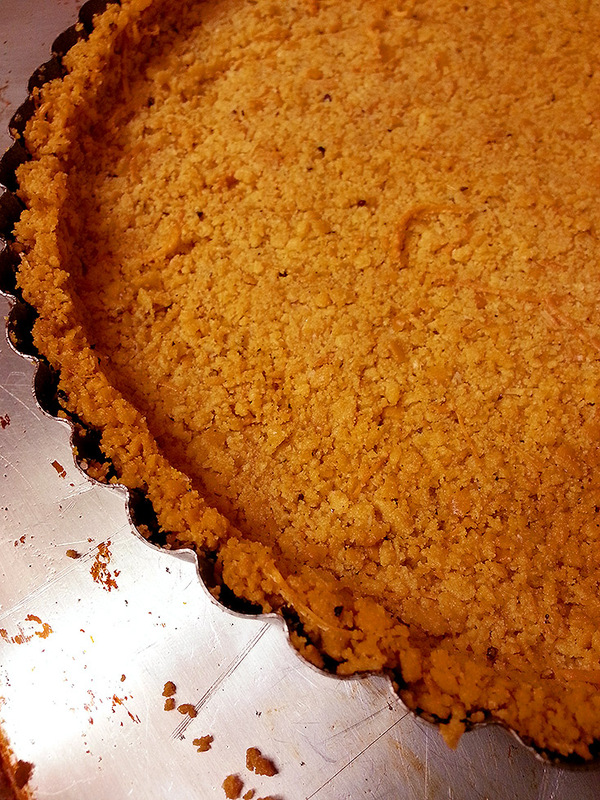 Spread the filling to the outside edges and smooth evenly with the back of a spoon. 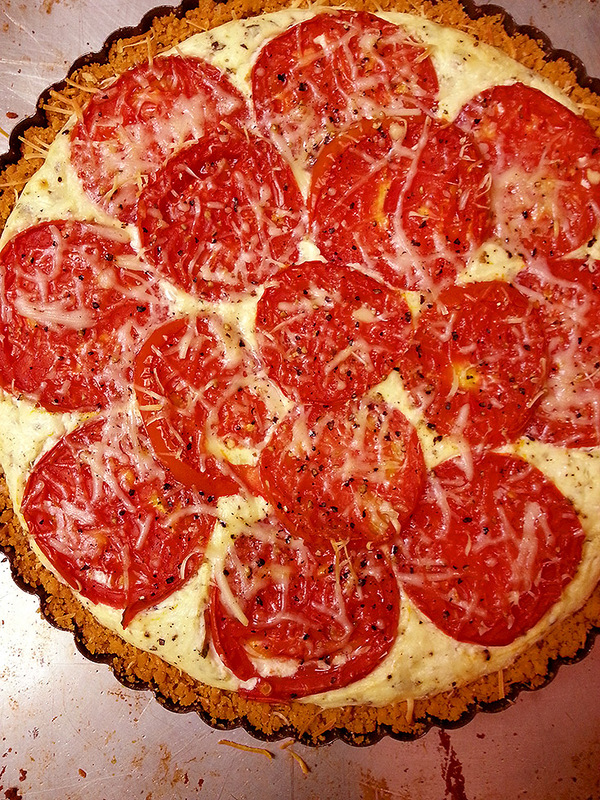 Arrange the sliced tomatoes over the top, sprinkle on the 2 tablespoons of parmesan cheese and a few grinds of fresh black pepper. 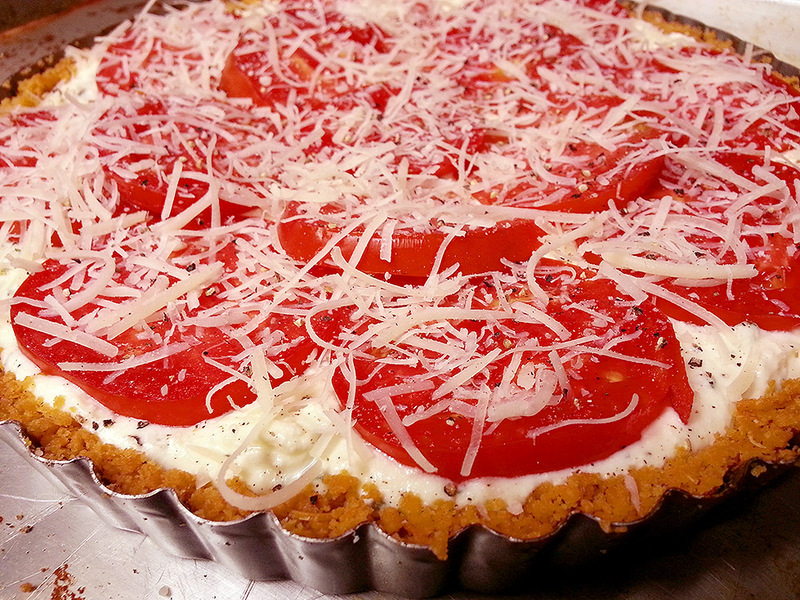 Put the tart into the 375 degree oven and bake for about 40 minutes, or until the temperature of the cheese filling hits 160 degrees. Let the tart cool on a rack once it’s out of the oven, and when it’s warm but not hot, carefully lift the tart out of the pan with the bottom still attached, and slide the tart with the pan’s bottom onto a serving plate. 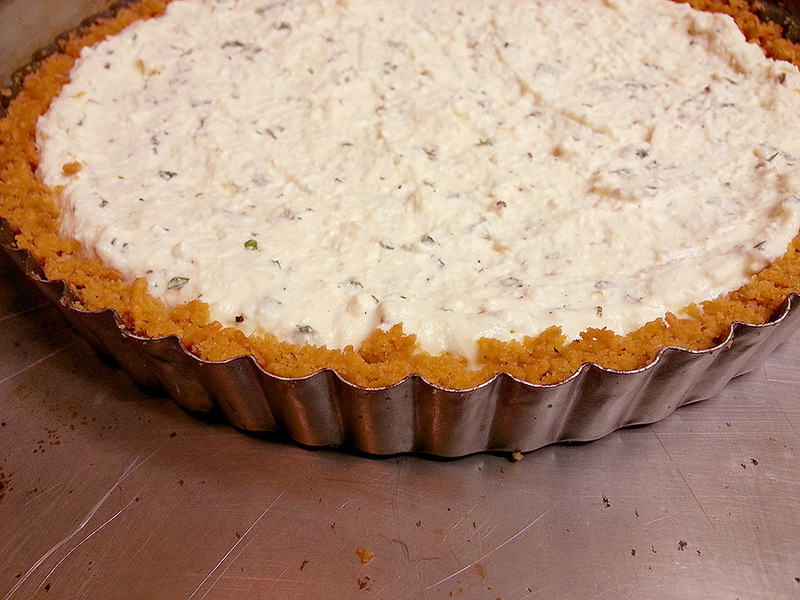 The tart is great served warm, but I honestly liked it better when it had time to get fully chilled in the fridge. If you want to serve it chilled, let the tart on the plate come to room temperature before covering loosely with plastic wrap and setting in the fridge for about 3-4 hours or overnight. 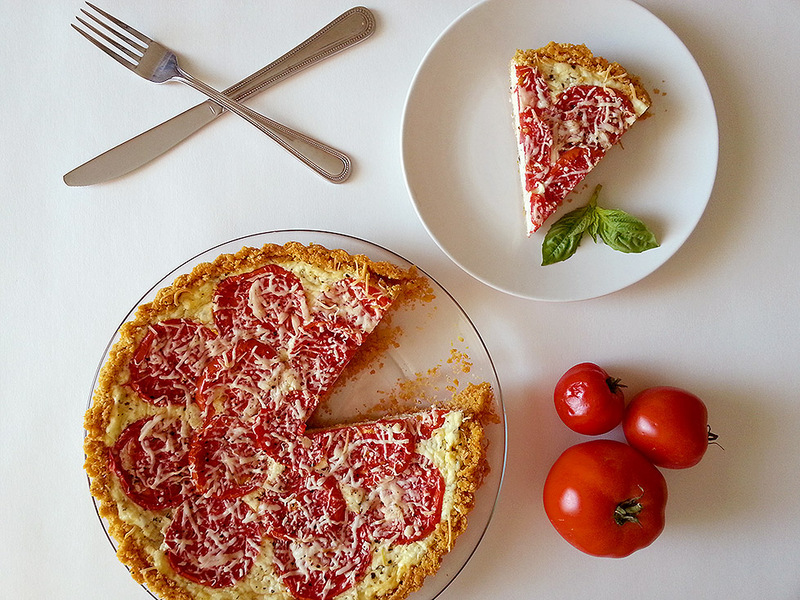 If you’ve chilled it but want to serve it warm, just pop a slice at a time into the microwave for 30-40 seconds and boom, you have some warm tomato + ricotta tart that’s just begging to be eaten! 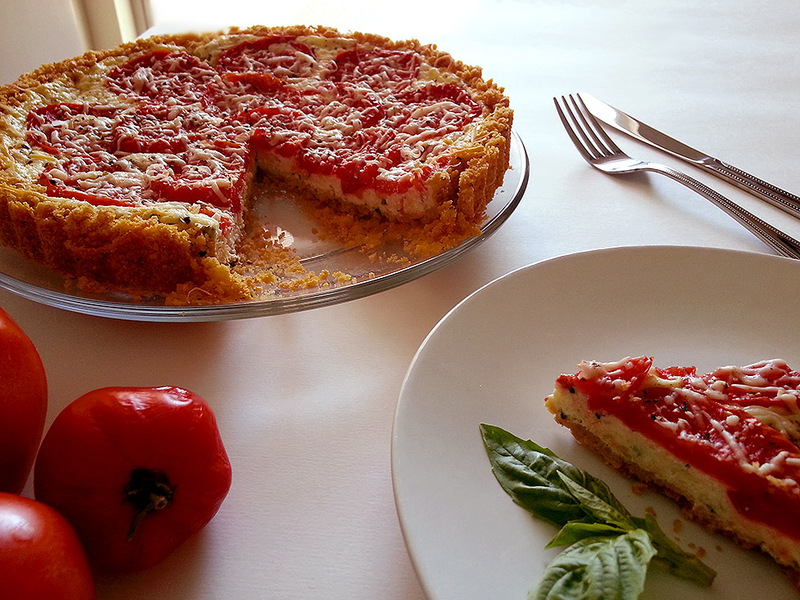 I prefer this tart chilled when serving simply because the flavors are subtle and delicate, and I feel that the fresh flavor of the tomatoes comes across better when the tart is not warm or hot. Try it out both ways and see which way you like best! You can always re-heat it or chill it later. The cold leftovers are dynamite! 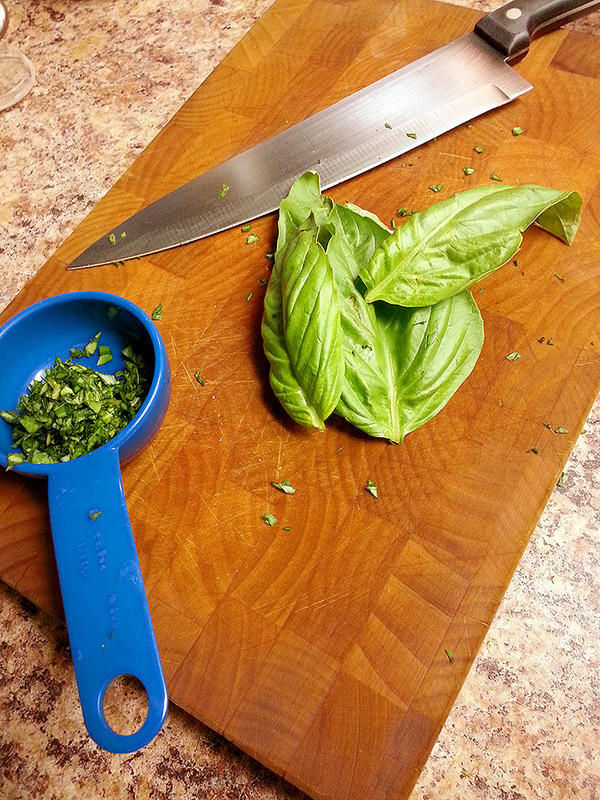 Serve it up with a big fresh salad and you have a light, simple and kinda elegant summertime dinner or lunch. It’s so good. Previous Previous post: sparkling fruit sodas!